'When one is in one's twenties, one tends to see things in perhaps too simple a way. At the time I was very attracted to the peaceful aspects of Christianity - Dona nobis pacem, "turn the other cheek", and so forth. The United States was mired in the war in Vietnam and many churches were active in rallies and other projects of the Peace Movement. I somehow overlooked the history of the inquisition and crusades, and hardly anticipated the trend of very recent history towards church support of capital punishment and various military endeavours. 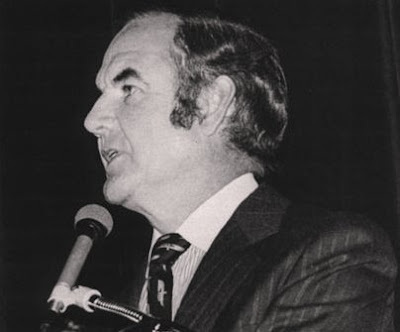 Thus the "Mass without Singers" was for me an anti-war statement, and I chose George McGovern as my dedicatee, believing that his tremendous loss in the 1972 election, his campaign had given legitimacy to the cause of peace' - writes Arnold Rosner in the notes for the new Naxos CD of his post-romantic Symphony No. 5 'Missa sine Cantoribus super Salve regina' from 1973 played by the National Radio Symphony Orchestra of Ukraine conducted by John McLaughlin Williams. The first ever recording of Rosner's "Mass without singers" is the latest release in Naxos' American Classics series, a project that is making a large amount of previously unrecorded and unfashionable music available. Ignore the condescending views of today's music pontiffs whose attitude has parallels in the Catholic Church's long history of prohibiting translations of the Bible to prevent the masses from making their own religeous judgements. Low cost CDs from Naxos and others are disruptive technology in the tradition of the movable-type printing that made translated Bibles widely available and triggered the Reformation. Forget whether Rosner's Mass is 'cool' or 'uncool' or first or third-rate. It deserves to be heard so listeners can make their own judgement. The coupling on this excellent CD is Nicolas Flagello's 1957 Missa Sinfonica. Flagello was a great artist, both in music and paint. Read more about him here.